Artlands is the new “brand” name for the bi-annual national Regional Arts Australia Conference and Festival which this year hosted international speakers alongside delegates from across the nation. Held in Dubbo, its ambitious and densely packed program was animated by the themes regeneration, connectedness and emergence. While it was possible to experience these in various combinations, this report reflects my own interests in the program, focusing on several highlights of its investigation into what we might mean by ‘regional’ in contemporary global culture. Skinder Hundal, Chief Executive, New Art Exchange, Nottingham UK spoke about New Art Exchange as a hub of cultural and social reinvention through diversity and experimentation in creative practice, focused on local/global interaction, and the engagement of local audiences by using local histories and practices. As well, he questioned our assumptions about how the arts ecology works, delivering a timely case study on the arts as a driver of inner city regeneration and bringing communities together. Rather than rethinking the idea of region, he proposed that we rethink the idea of centre. This was an exciting proposal, although the differences between UK and Australian regions are very marked. Focusing on ways to engage artists as agents of change in immediate and direct ways, exemplary presentations on this complex topic ranged from a discussion of art and social justice to art as a measure of quality of life, especially made meaningful through creative expression, including in the face of death and in tackling a serious crisis, such as HIV in the Free State of South Africa. When health funding is very limited, artists can be instrumental in creating strategies and discourse. Here in Australia, Kym Rae, Director of the Gomeroi gaaynggal (Babies from Gomeroi lands) program, was very frank about the way fostering creative practice in First Nations communities could have a significant impact on mental health outcomes in much quicker timeframes than a solely medical approach. On recasting art and theatre practice in rural communities, Henk Keizer, Co-Coordinator of Rural Routes in The Netherlands, spoke about long-term projects in the farming areas of the Netherlands that have needed, and employed, artists to articulate community experiences and concerns to government, commissioning theatre and performance to communicate more effectively. With regard to methodology, including in terms of research and development and the need to invest time in rural locations and communities, this was an effective lesson in the demise of fly-in-fly-out approaches to cultural production. By contrast, even with a distinguished line-up of speakers—Michael Brand, Director, Art Gallery of NSW, Dolla Merrilees, Director, Museum of Applied Arts and Sciences, Blair French, Director Curatorial and Digital, Museum of Contemporary Art, Caroline Butler-Bowden, Director of Curatorial and Public Engagement, Sydney Living Museums and Steven Alderton, Director Programs, Exhibitions and Cultural Programs, Australian Museum—the institutional presence of large key organisations provided little more than animated press releases (albeit quoting some impressive regional audience numbers for their programs), but a dearth of considered embedding of cultural process over time. The MCA’s C3West, a long-term project in Western Sydney (in partnership with councils and businesses) was an example of artists working with communities to deal with urban social and cultural issues, but without necessarily serving as a transferable model for regional needs. The exceptions here were Sydney Living Museums, clearly taking the initiative with ongoing programming, and the Australian Museum with its considered repatriation of Indigenous objects program and community building through working with families and in relation to artefacts in its collection. These programs seem symbolic of real institutional change, deep understanding of cultural issues and the inclusion of Aboriginal history. The heart of the conference was without question the generous and rigorous presentations by First Nations speakers. I cannot stress enough the power of their direct address—based in personal experience—to move, inspire and galvanise. In his opening keynote about sovereignty Mark McMillan, Associate Professor, Melbourne Law School invited us to consider creative making as a meeting place, where acknowledging sovereignty is a personal, transformative and mutual experience that takes place through culture and cultural production. Lee-Ann Buckskin spoke eloquently about mentoring and agency, championing the expertise and experience of First Nations artists and arts workers; and Rhoda Roberts articulated the impact of institutional intent in including First Nations content and context across all aspects of cultural production. I particularly valued her impatience with ‘closing the gap’ rhetoric and her provocation that instead of First Nations people adopting Western cultural aspirations, that the broader population should “sit down with us.” I can only hope that these ideas are taken up by all who attended, and that this translates into action across the sector. A highlight of the Festival program was a small but coherent exhibition at the Fire Station Arts Centre. Wala-Gaay was an ambitious group show of artists who were part of the Orana Arts Left Field Project, a long-term creative mentoring program in its second year. It presented a collection of powerful, visceral, diverse works engaged with historical references, lived experience and culture in the present. All were by local regional artists who were encouraged throughout the project to work in new ways with previously untried materials. Jason Russell’s (Worimi) Taken from Country is both a visceral image of violence and colonial rule, and a highly resolved physical presence that brings the viewer into the work. Arresting from the moment you enter the space, neck irons hang in line in front of an old saddle, keys attached—symbols of imprisonment and subjugation, equal parts beauty and horror. 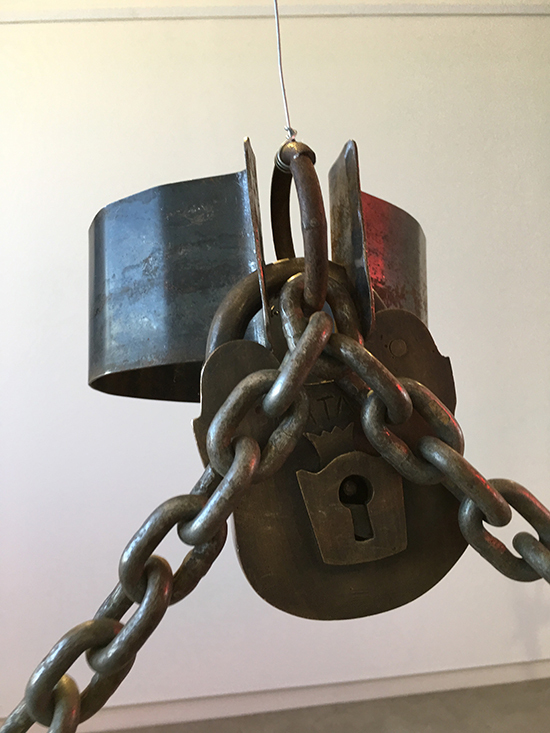 Locked up, by Dylan Goolagong (Wiradjuri), reflected on museum practice and its historical roots in theft and acquisition, asking who has access to and who act as gatekeepers for First Nations cultural artefacts. 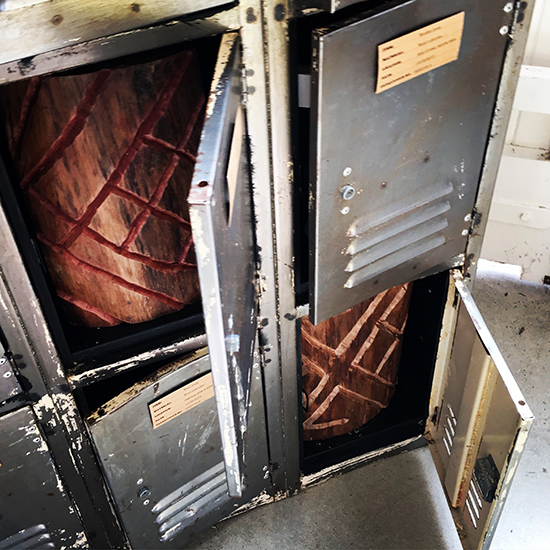 A series of crosses and carved wooden blocks hidden in a set of old steel lockers, the work questioned viewers’ notions of what is sacred by placing a physical barrier—a closed door—between us and some elements of the piece, while echoing the systems and structures of collection and display. Our girls by Paris Norton (Gamilaroi) is a lyrical and painstaking memorial to young women who were stolen and taken to homes to be trained for a life of domestic servitude by the Aboriginal Protection Board. 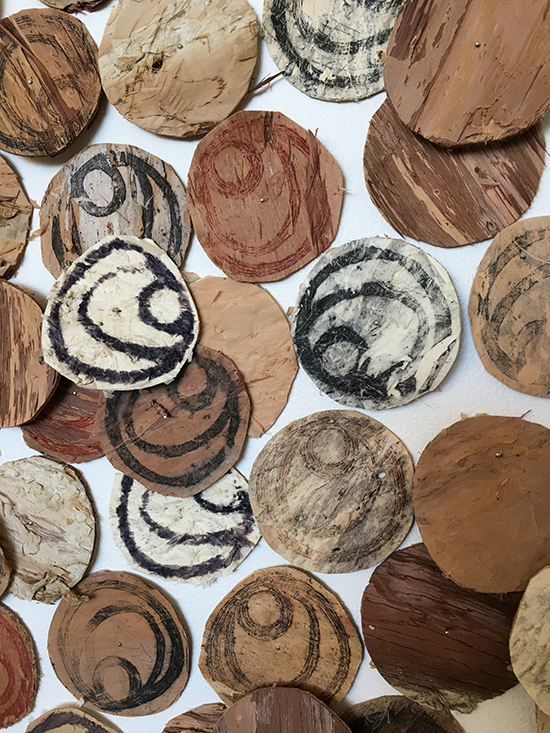 Each hand-painted and hand-cut circle of paperbark, as personal as a fingerprint, is an eloquent stand-in for records that were lost or destroyed, and lives profoundly altered, under this regime. All these works are direct yet densely layered and moving. There is not space here to discuss the equally accomplished works by Aleshia Lonsdale, Alex Nixon and Robert Salt; and credit must also go to mentors Blak Douglas, Jonathon Jones, Chico Monks, Nicole Monks and Jason Wing, and curators Khaled Sabsabi and Emily McDaniel. While there were moments where the viewer could see the influence of a mentor, there was more a sense of artists entering into a field of practice rather than imitation, and the diversity of the work was testament to the benefits of structured support and creative dialogue. It was exciting to see a local event that so clearly stood out in an abundant program of interesting work from around the nation. This is a show that deserves to tour; and I hope to see more work – more bodies of work – by these artists in the future. Equally, given the ways artists were being recognised as the motor of engagement, community building and delivering outcomes, a dialogue with what artists need to produce these outcomes—over the long term, and with adequate remuneration—should have been an important inclusion. Austerity politics and diverted funding have devastated budgets within the arts, but also in arenas where artists are increasingly the service bearers of not just creative or cultural outcomes, but diversity, health and community outcomes as well. And in this context is it too much to expect inclusivity to extend to queer artists and artists with disability? Both were conspicuous in their absence from the programs I attended. The conference concluded with a discussion of the future and a panel on thought leadership, bringing together Wesley Enoch, Artistic Director, Sydney Festival, Lindy Hume, Artistic Director, Opera Queensland and Mathew Trinca, Director, National Museum of Australia to imagine futures, collaborations and new approaches. While attempting to redefine the idea of what the regions are—in their diversity—there was a clear call for us as a field to name and promote and value what we already do, and to articulate that value more effectively in order to have it recognised. I think Wesley Enoch queried the term ‘regional’ in the most productive ways: through speculating about working region to region, relocating large companies to regional towns and suggesting that large established institutions and organisations forego government funding. I took this to mean in favour of the smaller organisations that form such a significant testing ground in the arts ecology. He also proposed no longer taking culture to the regions, instead developing and supporting culture in the regions, and in a global not just national context. He also suggested how we can all take action in the current climate: go to more shows, practice your elevator pitch and meet five strangers and start a dialogue that lasts at least a year. The next ARTLANDS will be hosted by Regional Arts Victoria in 2018. Liz Bradshaw is an artist and cultural researcher. She gave a presentation at ARTLANDS on creative education for dLux Media Arts.